The hard part is deciding what I want to eat. I’m still barely eager to eat, let alone experiencing any cravings, even though most of the nausea has gone away. I didn’t know if I wanted it at the time, but after my mom made this dish of Pork Stuffed Fried Tofu, I happily ate it up. 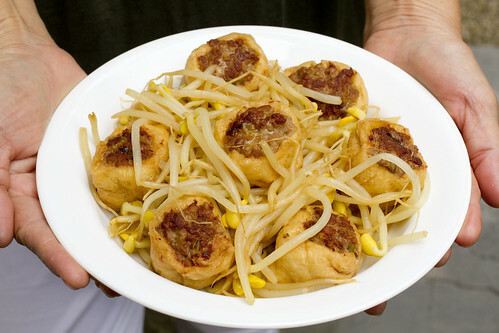 This is a home-style dish that many Chinese moms make, always their own variant. You’ll seldom find something like this at a restaurant, so if you like the way this sounds, break out your wok. Luckily it’s not very hard to make and doesn’t take much time. 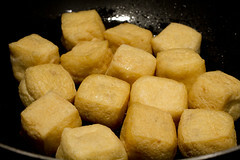 The one hard part may be identifying the type of fried tofu to buy, especially if you’re not an experienced tofu shopper. 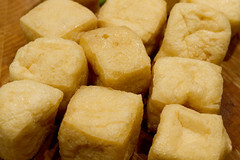 This type of fried tofu, called “yo dofu”, is spongy on the inside and not as dense as regular fried tofu, which is completely firm, or soft tofu that has been fried. Look for this in clear packages in Chinese supermarkets. Here we used the ones that are roughly small cubes. They also come in a large spherical size/shape. 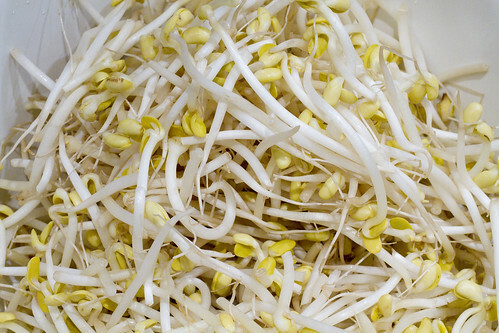 Also keep in mind that we’re using soy bean sprouts here which have a bigger bean part than the mung bean sprouts more commonly found in supermarkets. You may have to go to the Chinese market for this as well (you’ll be there anyway for the Yo Dofu). 2. 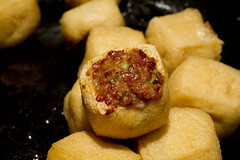 Poke a hole in the center of a piece of fried tofu and stuff with pork mixture. Pack in tightly. Repeat until you finish stuffing all the fried tofu pieces. 5. Add 1 cup water, garlic, and remaining tablespoon of soy sauce. Toss and cook covered until sprouts are tender, about 5 minutes. Adjust seasoning, making it saltier if you want to eat it with rice, and less salty if you are eating it alone. Serve immediately. 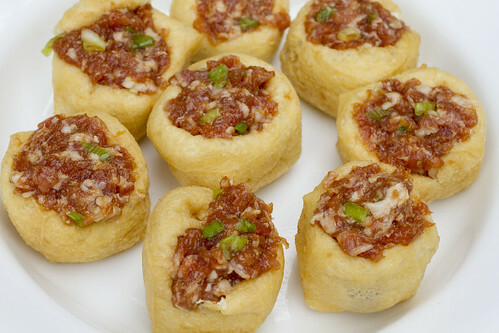 Left-overs can be saved in an airtight container in the fridge for one week. Reheat in the microwave. posted by jessica	at 11:09 AM	Filed under Chinese, Recipes. You can follow any responses to this entry through the RSS 2.0 feed. Both comments and pings are currently closed. Sadly, the only Chinese supermarket within a 300 mile radius doesn’t carry fresh produce. 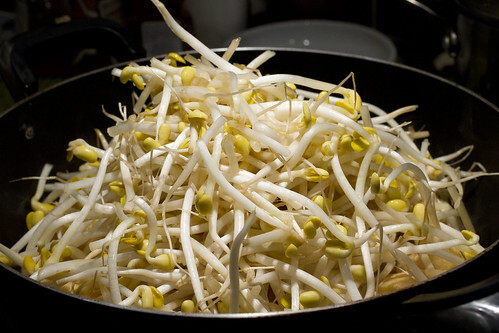 Would the regular sprouts you find in the store work, or are the soy sprouts integral to the dish? I’m so sorry you’re still not feeling up to eating–I imagine not being able to enjoy food is frustrating for someone like you! If it makes you feel any better, my sister-in-law just found out she’s having twins! 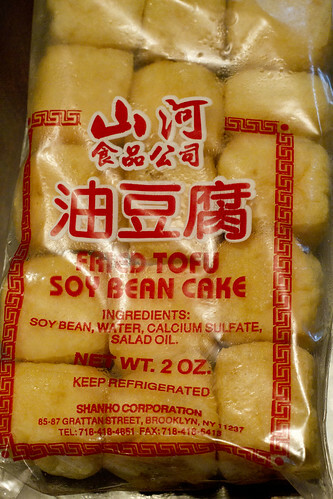 Hmmm, there are two markets in mind that just might sell this tofu. This would be an awesome recipe to try. EMC, the regular (mung bean sprouts) will taste good but different. You can try it and see if you like it, but make sure to cook a lot less time. 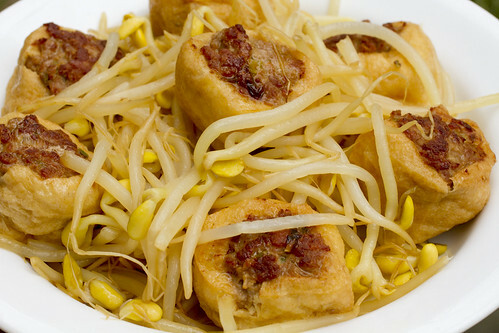 Cook the pork stuffed tofu longer before adding so that the meat is cooked through though. Twins! How exciting! Are you going to be an aunt for the first time? i can think of no better way to make tofu appealing than to fry it AND involve pork. bravo. Just discovered your site last night late. Made a trip to the Asian grocery today and am making this for dinner. Also, thrilled to find the little packet of preserved vegetable to add to my standard green beans & pork. The aroma tells me this will be the ‘secret weapon’ of flavor in that dish. Thanks LeeAnne! Can’t wait to hear your feedback and if you like taking pics of your food, we share our fan pics so send them to me! Sushi Girl, you can try bok choy or any other vegetable. It will taste different and may require different cooking times, but use what you like. 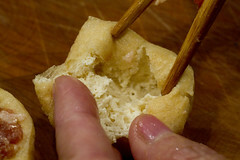 I was looking for a pork stuff bean curd recipe to use as my base, and this seems to be close to what i’m looking for. For some added flavor, try a drizzle of sesame oil in the pork mixture. I noticed you said you had morning sickness, thus pregnant, and from what I know, it’s not recommended to eat bean sprouts during pregnancy as they are carriers of E. coli and Salmonella. Just an FYI for the future, as I’m sure you have already had baby by now. Cheers and thanks for the recipe. Dr. Who, didn’t know about the bean sprouts but I’m assuming that like meat, also fine when cooked through right?